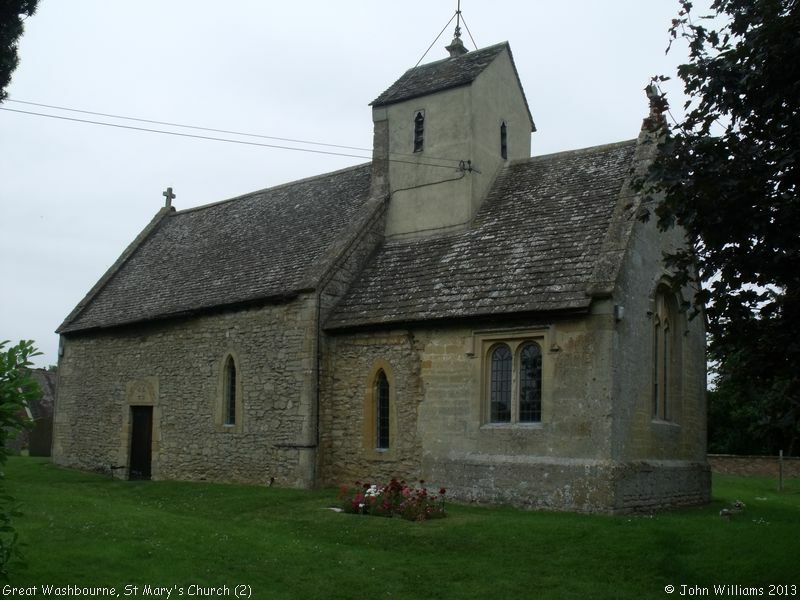 Kelly's Directory of 1923 describes St Mary's Church as "a small and very ancient building of stone, in the Early English style, consisting of chancel and nave, north porch, and a turret on the western gable containing one bell, cast in 1857". 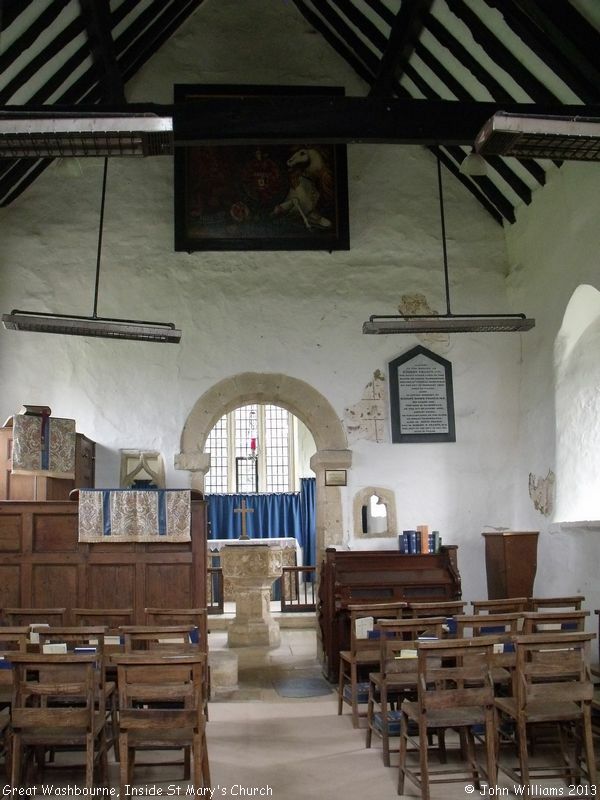 According to the Victoria County History series: A History of the County of Gloucester, Volume 6: Slaughter hundred, and the upper divisions of Tewkesbury and Westminster hundreds (1965), pp.232-237 (Great Washbourne), it was built in the early 12th century, as a chapel of ease to Beckford (Worcestershire), but "in 1177 the Rector of Beckford, in an agreement about tithes, released all his rights in Great Washbourne to Tewkesbury Abbey", and from then on it was administered from the Abbey, with presumably one of the monks holding services in the church - "the priest who was curate in 1532 and 1548 was described as formerly religious in 1540". 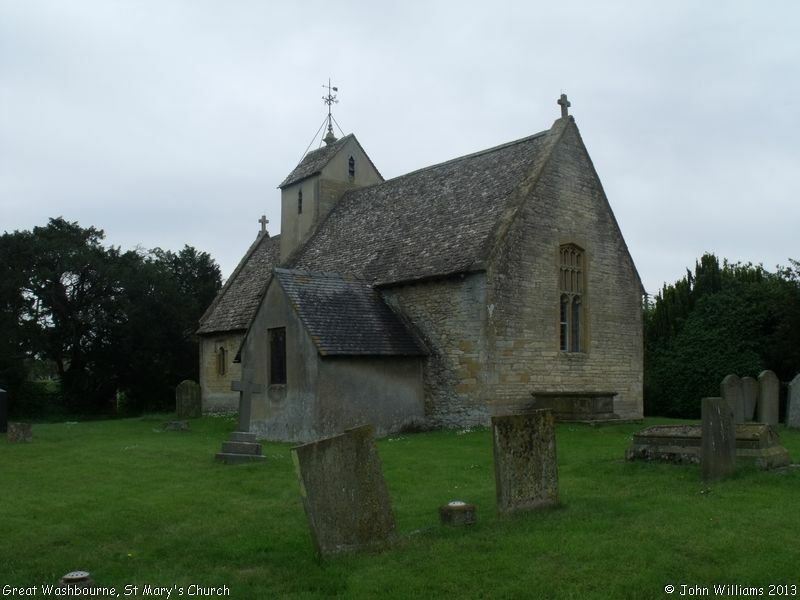 Evidently that changed after the Dissolution, as "the rectory estate, including all the tithes and the right to nominate the curate, was granted in 1574 to Drew Drury and others", though for much of the 18th century it was served from Beckford. However between 1842 and 1875 and from 1884 onwards the perpetual curacy was held together with the rectory of Alderton. "From 1875 to 1883 the living was held by Robert Winning, a qualified physician and barrister as well as a clerk in holy orders". The building itself, according to the VCH account, dates from the 12th century, most of which still survives. 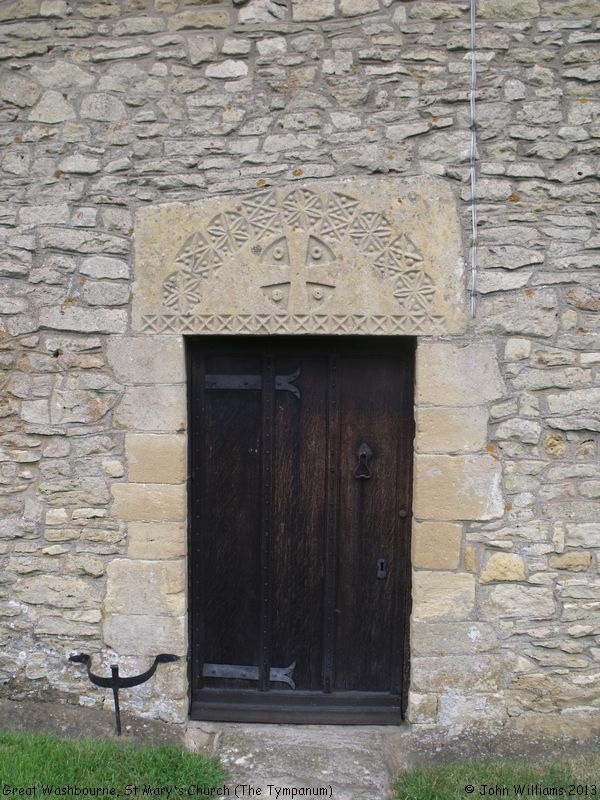 "The north doorway has a plain semicircular arch; the south doorway has a similar arch internally but on the outside has an unusual lintel carved with panels arranged in a semi-circle like a tympanum". "The royal arms, a palimpsest on canvas, are those for the period 1801-16 though inscribed for George IV, suggesting that they have been brought up to date more than once". The children from Great Washbourne in 1923 attended school at Beckford, whilst those from Little Washbourne attended school at Alderton. St Mary's Church, Great Washbourne shown on a Google Map. Places of Worship in Great Washbourne shown on a Google Map. I have found many websites of use whilst compiling the information for this database. Here are some which deserve mention as being of special interest for Great Washbourne, and perhaps to Local History and Places of Worship as a whole. Information last updated on 30 Dec 2014 at 14:15. This Report was created 27 Mar 2019 - 10:16:10 GMT from information held in the Gloucestershire section of the Places of Worship Database. This was last updated on 7 Feb 2019 at 07:45.